Snapchat introduces new Cat Lenses that enables user to add filters to the furry feline face. Snapchat has introduced a new feature called Cat Lenses that will enable the user to add filters to the furry feline’s face. Being rolled out globally, the new Snapchat Cat Lenses are designed to recognise a cat and “decorate” it with various filters. Snapchat says the new Lenses are inspired by cat-themed memes on Internet and Snapchatters’ cat snaps on the platform. The Cat Lenses will pop up alongside other face Lenses in the Lens carousel with a “designated paw print” on the Lens icon. While selecting the feature, an on-screen tip will show up asking to pick up the furry pet. 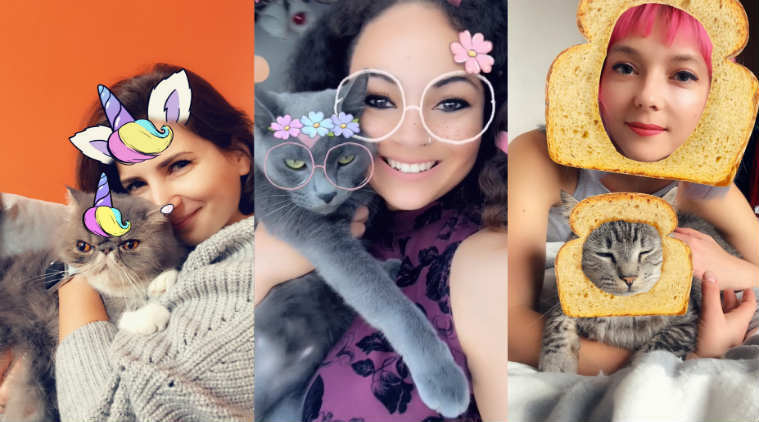 Besides adding filters to the feline face, Snapchat users can check public Community snaps as well by entering “cat” in Discover. The company states that over 70 million users play with Snapchat Lenses each day with an average of three times play each. While Snapchat has already added the ability to recognise things like food, sports etc and suggest relevant filters, TechCrunch points out that the new feature is likely to build on the same ‘system’. The US-based company recently announced the release of a dozen of original series on its mobile app. The programming slate announced last week brings a host of series like “Class of Lies” a scripted show, “Endless Summer” a documentary series etc. According to Bloomberg, the idea behind the release of original shows is to keep users on the Snapchat app for longer periods of time and sell advertising to those companies who are looking to reach a ‘youthful’ audience.